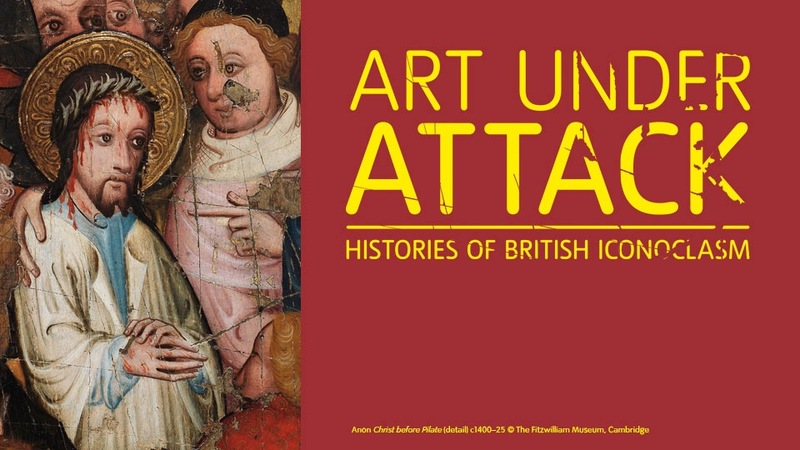 From now until 5 January 2014, Tate Britain is hosting an exhibition titled “Art Under Attack: Histories of British Iconoclasm”, exploring examples of religious, political and aesthetic iconoclasm over the past 500 years of British (mostly English) history. A manageable size and easily seen in a couple of hours or less, the exhibition progresses chronologically, beginning with the religious iconoclasm instituted under Henry VIII, and furthered by Edward VI, Elizabeth I, and the Puritans. The history of religious iconoclasm comprises half of the exhibition, and throughout, one is invited to reflect upon decapitated sacred figures, devotional books where images of God the Father have been meticulous removed, and re-constructed stained glass windows. Some of the figures were particularly moving, such as the sculpture of the once enthroned figure now bearing scars from the axes that exacted the damage or the head and upper torso of the Virgin with just the hand remaining of the Christ child. Other pieces and the accompanying commentary suggested that this period of iconoclasm was multivalent in its motivations for the political seemed just as powerful as the theological. The remainder of the exhibition considered political and aesthetic iconoclasm. The political dealt with the role of sculpture in the public square, particularly that of political figures destroyed in acts of political protest. There was also a room devoted to the defacement the suffragettes did to important works of visual art in Britain’s museums in the 1910s. The first room about aesthetic iconoclasm show works defaced in protest for their offensive subject matter or to their acquisition by a public museum. Up to this point, the exhibition considered iconoclasm from the perspective of the viewer acting on the art work. The final two rooms turn the tables to consider when artists engage in acts of destruction to create new works of art. While there are notable aspects to each part of the exhibition, this review will focus on the section on religious iconoclasm. For me, what was most interesting in the religious section was seeing how Church and society grappled with the emerging theology against images and in support of the unmediated Word. There were examples of anti-papal propaganda as well as a particularly interesting stained glass window created in 1629 that justified its existence by including with the following words below the image: “the truth here of is historicall devine and not superstissious.” The image is justified by its appeal to the Word. Further, the image used on the exhibition publicity, “Christ Before Pilate,” shows clearly the kind of defacement that happened during this time. The accompanying information explains: “Following their removal from churches such images were supposed to be defaced before sale to prevent a return to their former use. They could be repurposed as table tops or cupboard doors … [about the Christ before Pilate] a network of deliberate diagonal incisions has been scored across their surfaces. This follows the letter if not the spirit of the law, as the image of Christ has received minimal damage.” Thus, while destruction and defacement was politically mandated, there is interesting evidence of the subversion of this command. As well, while the image was made suspect, this did not mean that the emerging Protestant church did away with art or painting. Three pieces of painted text in the exhibition attest to this. One is of a rood screen, whitewashed with biblical text painted on top. Ironically, time has worn away the whitewash and the original Man of Sorrows image is now visible behind the text, creating a (quite effective) juxtaposition of word and image. 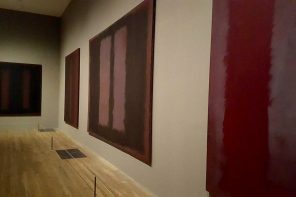 The other two are triptychs: the first is of the Ten Commandments that was installed where the altar originally was and on the second, Biblical passages denouncing images are painted so that they can be read when the triptych is closed. Throughout, I was struck by the power of art to evoke strong emotion and response because of what it symbolises. 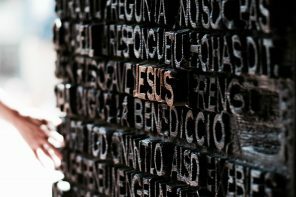 For the religious iconoclasts, while destruction might have been commanded by the King, it was accompanied by a fundamental change in theological understanding about how God was (or wasn’t) mediated to humanity. Throughout the exhibition, theological thinking which motivated the iconoclastic action is hinted at — about a very naturalistic sculpture of a dead Christ: “it was this type of emotionally-charged image that Protestant reformers found dangerous and sought to eradicate;” “images of the Virgin were specifically targeted by iconoclasts, and single figures with a high degree of realism were considered especially dangerous;” “scoring out eyes and faces to prevent a direct path of communication between image and viewer was a common strategy of iconoclasts.” While a church historian could bring a deeper level of understanding to what was happening theologically, this exhibition demonstrated that the iconoclastic action around the time of the Reformation was complex and bound up in theological, political and national agendas. While it would have been interesting to extend the scope of religious iconoclasm (such as more contemporary censorship of the arts), this exhibition is a great historical starting point for the discussion. Learn more about the exhibition catalogue here. Review by Sara Schumacher. Sara Schumacher is Editor-in-Chief of Transpositions and an ITIA PhD Candidate, researching contemporary church patronage of the arts.